Story of the birth of King Bharata as deer in his next birth is one which symbolically explains about attachment. King Bharata, after whom our land came to be called Bharatavarsha, discharged his duties as a king and father and then retired into the forests as a wandering ascetic. Abandoning all desires, alone, peaceful and blissful at heart he was immersed in worshipping Srihari Vishnu. 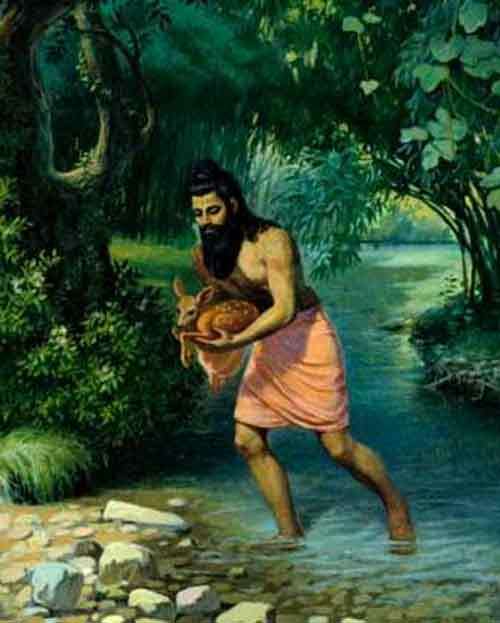 One day, overcome with pity, he saved a motherless fawn from being drowned in the river and then brought it to his ashrama. He fed it, fondled it, protected it and tried to please it in every way. Obsessed with the deer and distressed by vague and baseless fears about its safety, he neglected his devotional practices. The deer became his anchor. Even at the moment of death his mind was firmly fixed on the deer and in the next life he was born as a deer.